I was having the time of my life. I grew my hair, joined a food co-op where I cooked for big events, went to free rock concerts in Central Park. And I took yoga. 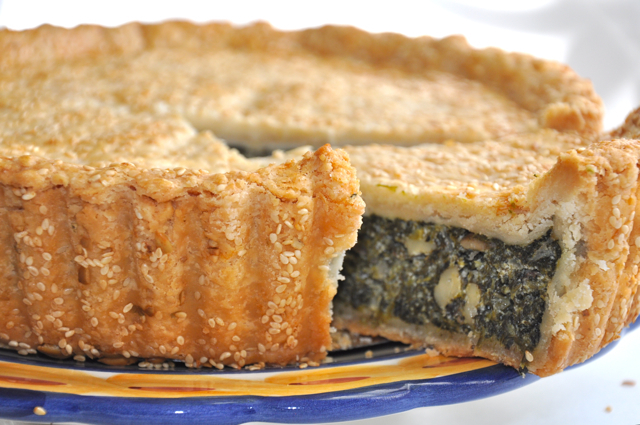 The yoga instructor was a cool dude and happy to barter lessons for just about anything, so one day I baked him a savory spinach pie. Weeks passed, then months without any mention of the pie, which I had baked and delivered to him in my favorite tart pan. After about three months I asked if he’d mind giving me back the pan, so he retired to his kitchen and soon emerged with the pan – which had never been washed. I will spare you the grisly details of that tragic tart pan crime scene. And I apologize for the fact that the only thing this post has in common with that incident is a savory pie. But it still sorta irks me after all these years and I needed to get it off my chest. 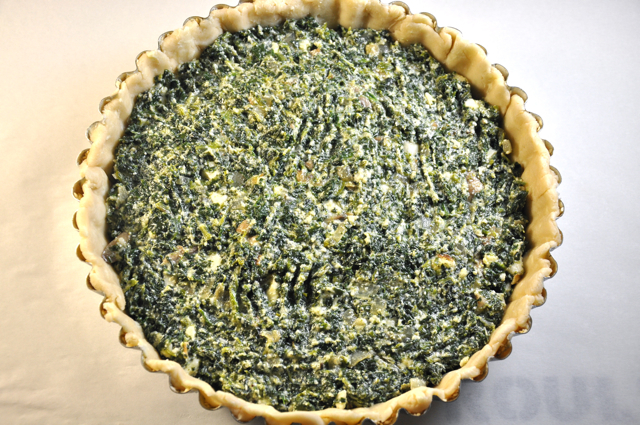 There are several things that set this savory pie apart, but – aside from the wonderful flavor – the one that will grab everyone’s attention is the seeded crust. 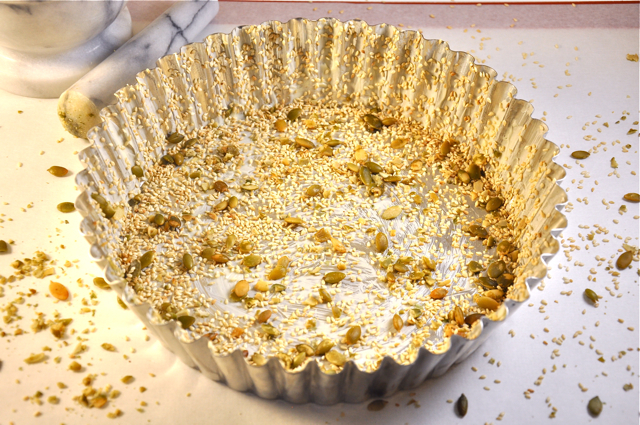 People will think you’re a genius, an artist, and all you did to create this drama was to sprinkle your pan with a heavy coating of sesame and toasted pumpkin seeds – like I did here – or other seeds of your choosing. I used my tall-sided, removable-bottom pan for this pie to maximize the seeded surface area; the effect is less dramatic, less visible, when your sides are a mere 1-inch high, instead of 2-inches the way they are here. I cook with fresh vegetables most of the time, but this is one case where I like chopped frozen kale. It’s just plain simpler, cuts down on the prep time, and I find the quality of frozen kale to be quite good. You will need enough dough for a double crust, so please use any buttery crust recipe you’re partial to. I give you several suggestions below. All that butter I mentioned earlier, for the sides of the pan? Well, if you’re baking this in a removable bottom pan, please bake the pie on a rimmed baking sheet. That butter is going to melt and leak out of the pan and you don’t want it cascading into your oven and smoking up the joint. If you have parchment paper around, line the sheet with it before putting the pie on top. It will help blot up the butter. This will be the centerpiece of your meal, and it is best flanked by something a bit sharp, crunchy and lean like marinated vegetables or thinly sliced cukes with a mustardy vinaigrette. A big, crisp chopped salad would also be excellent. Here’s to a fabulous New Year. 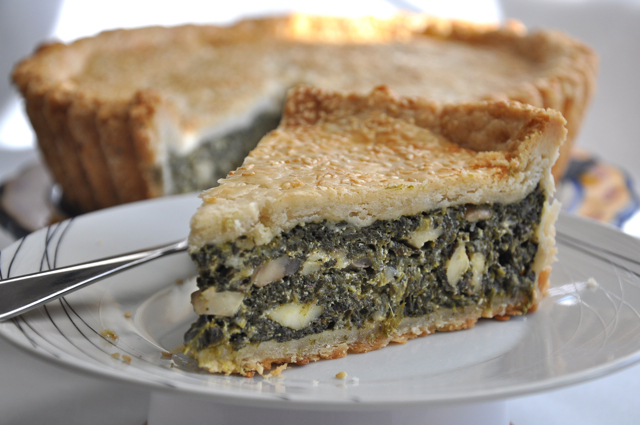 Let me know if you do bake this cheesy kale pie, and how it turns out. Winter is a great time to bone up on your pie making skills. It’s not as hot or humid as summer, so your pie dough is much better behaved. And these cold, gray days are the perfect time to stay inside and putter in the kitchen, perhaps making some tried-and-true Comfort Food classics. With that in mind, we’re offering a very special shipping deal on all of the books in our store – but this weekend only. Here’s how it works: go to our store and browse through the books, pick out those Ken titles you’ve been meaning to add to your cookbook library. But don’t order the books directly from the store. Instead, send us an email telling us which books you’d like to order, including your shipping address and how you’d like them inscribed – for you, or for someone else. We’re happy to mail to different addresses if you want a book for your pie making son, daughter, niece or mom – whomever. We’ll email you a PayPal invoice, and charge you just two bucks for shipping for each title you order. This offer ends Sunday at midnight, so get your order in right away. Let us know if you have any questions. 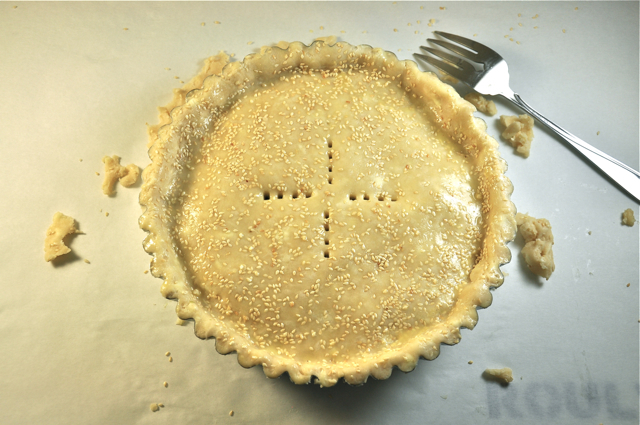 PIE PASTRY NOTES: Use any double crust dough recipe you like for this pie, or the Slab Pie Dough divided into two equal size disks, or two batches of either the Good Basic Pie Dough or Food Processor Pie Dough. Cook the kale according to the package directions and drain it well in a colander. When it has cooled enough to handle, gently squeeze it in your hands to get out a little more moisture, but don't overdo it: you need some moisture so the filling isn't dry. Transfer the kale to a large bowl. Melt the butter in a large skillet over medium heat; stir in the onions. Cook, stirring often, for 8 to 9 minutes, then stir in the mushrooms, garlic, and a bit of salt, to taste. Cook for several minutes, until the mushrooms have put off some moisture, then - while the mushrooms are still juicy - remove from the heat. Add the sauteed vegetables to the kale. Add the feta cheese, ricotta or cottage cheese, and Parmesan cheese. Mix lightly. Add the eggs, parsley, dill and nutmeg and mix well. Salt and pepper the filling to taste. Preheat the oven to 375°. Get out a 9 1/2" - 10" tart pan or a deep-dish pie pan. Butter the insides generously with soft butter and sprinkle heavily with your seeds. 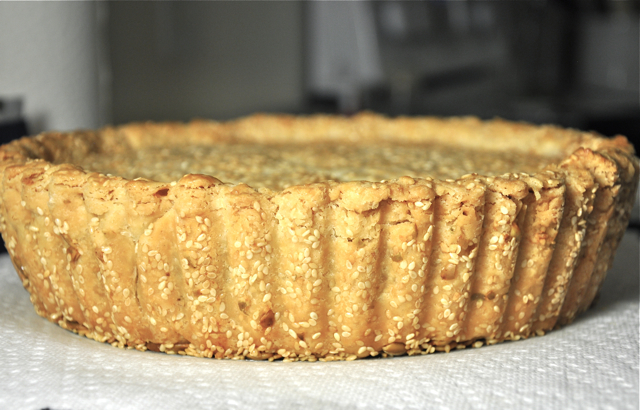 Roll half of the pastry into a 12 1/2" - 13" circle and line the pan with it, leaving a little overhang. Spread the filling evenly in the shell. Roll the other half of pastry into an 11-inch circle. Sprinkle generously with seeds, then run your rolling pin over them gently, to embed. Drape the pastry over the filling. Pinch the edges of the pastry together and form a decorative edge, if desired. Or use a fork to crimp the edges together. Make several steam vents in the top pastry with your fork. Lightly brush the top of the pie with the egg glaze. Place the pie on a rimmed baking sheet - especially if you're using a removable bottom pan - and bake for about 1 hour to 1 hour and 15 minutes, until the top crust is a rich golden brown. You may also notice the top crust lift or puff up very slightly, which is a good sign. Transfer the pie to a cooling rack and cool for at least 30 minutes before slicing, a little longer if you're de-panning the pie. The longer it sits, the more stable it will become. Makes 8 to 10 servings.